Seamlessly combining a powerful 40 watts speaker & a VHF wireless microphone into one compact and lightweight portable PA system, the Hisonic HS210 has everything needed for voice and sound amplification. No assembly required! No extra equipment to purchase! Open the box and switch it on, let the show begin! Powered by a Li-ion rechargeable battery pack, the HS210 can continuously run for up to 10 hours when fully charged, ideal for indoor or outdoor events, small or large. A power cord is included for charging the battery and powering the unit. For added convenience, a 12V DC power cord is also included. Built-in with a VHF wireless receiver, the HS210 includes a handheld, a belt-pack transmitter with a headset and a lapel to choose depending on applications. Better yet, the HS210 is equipped with the latest 2.4G technology for wireless streaming music from devices such as your mobile phone, notebook, iPhone or iPod. What's more, this system also comes with both USB and SD Card reader, a fully featured plug-n-play MP3 player/recorder with remote control and an FM radio. 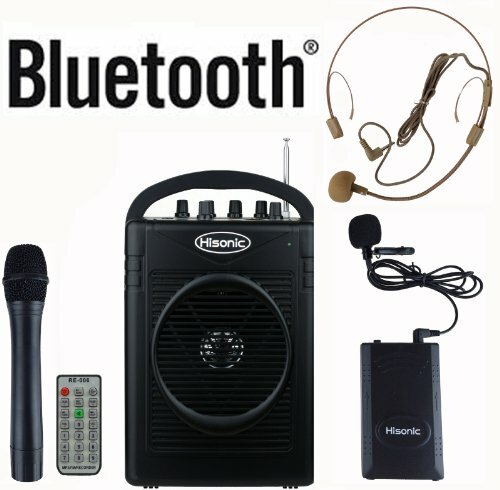 With its versatility and portability, this system is an ideal companion and indispensable tool for professionals such as teachers, auctioneers, street performers, studio instructors and alike who place heavy stress on their voice cords on a daily basis. This is your voice SAVER! Dimensions: 11" x 7" X 4 ½"
Built-in VHF wireless microphone system featuring one handheld microphone, one belt-pack transmitter with the options of either a lapel or a headset microphone for hands-free applications (only one wireless microphone can be used at any given time).